The Lucene Revolution conference may be over, but that doesn’t mean all the sessions and information disseminated during the conference is yesterday’s news. 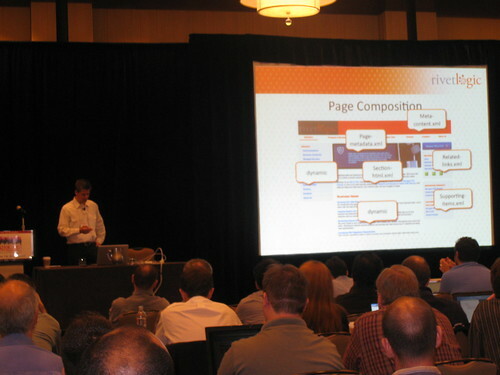 With over 300 total conference attendees, there was a clear interest in Lucene & Solr open source search technologies. All the speaker slides and select video presentations are now available for download on the Lucid Imagination website. The webcast also discussed the quality and scalability of Lucene/Solr and how it’s being leveraged in large-scale sites including Twitter, LinkedIn and Zappos.com. Lastly, a sneak peak of the new LucidWorks Enterprise development platform showcased some of the built-in features that makes developing search applications easier and more accessible. The slides from the presentation are available for download here, http://bit.ly/searchalfresco. 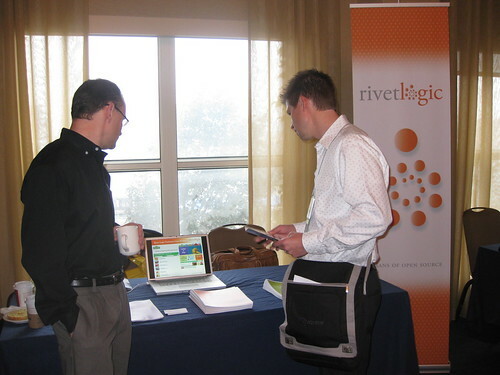 Rivet Logic was one of the partners that participated in the Beta Test of LucidWorks Enterprise. Hear what our very own Sumer Jabri and Paras Jain, along with other system integrators, have to say about their experience working with LWE. Last week’s Lucene Revolution conference in Boston was the first conference dedicated to open source search in North America. It generated a great turnout and a lot of buzz around Lucene/Solr. Presented by Lucid Imagination, the conference brought together users, developers, thought leaders and market makers for two full days of sessions on the innovative Lucene/Solr open source search technology. The conference kicked off with a panel of search engineers from flagship firms including Twitter, eHarmony, LinkedIn, and Salesforce.com. Lucid Imagination also officially announced the release of LucidWorks Enterprise (LWE), a search solution development platform that delivers the power of Solr/Lucene technology in a convenient, robust, well-organized package. Rivet Logic participated as both a sponsor and speaker, with our very own Michiel Verkaik presenting a session on Alfresco WCM and Solr integration. Throughout the conference, the sessions continued to generate buzz as well as provide both developer and business focuses tracks around open source search and the promising outlook for its future. Some of the other topics covered include real-time searching with Solr, open source market trends, open source search in BI, how search enables cloud applications, and what’s in store on the Lucene/Solr roadmap. Today organizations of all sizes are adopting wiki solutions as a way to facilitate communication and collaboration around planning, projects and departmental matters. Wiki solutions allow users to attach documents to pages and to hyperlink to those documents from other pages. This is extremely useful, however documents, which have traditionally been stored and secured on corporate shared drives are now living in separate places. Some now live within the wiki, while others continue to live on file servers. This is an example of an age-old issue in technology; as we bring in new tools that provide us with more options and better ways to work we are faced managing the side effects of a growing technology footprint. This issue is not new technology, but instead, one of architecture. As our needs grow we need to adjust our architecture to accommodate new demands. In this case, what we need to do to solve the problem is to separate a few concerns. Some users want to access the document through a file server (shared drive) while others want to access it via the wiki. Traditional shared drive technology doesn’t do a great deal to help us accommodate this. Traditional shared drives provide file system access to documents but lack APIs that allow us to get to our content by more sophisticated means. Further, most wiki technology is one sided as well; while a wiki solution may provide web based access via pages and services they tend to lack file system access. Finally, even if the wiki could “project” its store as a shared drive it’s not likely to be the proper system of record for your documents. By separating the issues of storage, management and delivery we can articulate a solution that allows us to serve documents through a traditional shared drive interface via a proper system of record while at the same time, providing APIs that allow us to get to that content as a service so we can incorporate better ways of working with the document through new technologies as they emerge. Enter Alfresco. Alfresco is architected from the ground up to be a system of record. It’s designed to provide API / service based access to your documents and content, as well as traditional shared drive access. Alfresco supports three different remote programming APIs including SOAP, webscripts and CMIS. And in addition to presenting itself as a file server so users can connect to it as a file share, Alfresco also mimics an FTP server, a WEBDAV server and even a Microsoft Share Point server. Alfresco is designed to store, secure and manage your documents and to provide access to those documents in the way that best suits your users. Alfresco’s capabilities go far beyond security and content retrieval. Once your documents are in Alfresco they can be searched, workflowed, transformed, translated, versioned and so on and so on, no matter how they are accessed; all through stock capabilities provided by Alfresco out of the box. This has been quite an exciting and busy year for Rivet Logic, between our open source contributions (i.e. Crafter Studio), the opening of our West Coast operations, and participation in numerous industry events. As we enter into Q4, things aren’t slowing down as we have a few more exciting events coming up. 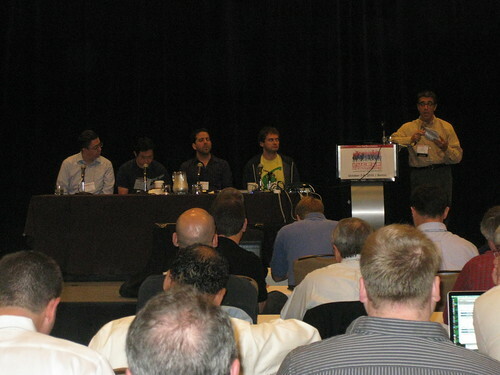 Lucid Imagination presents Lucene Revolution 2010, the first conference dedicated to open source search in North America. Rivet Logic will participate as both sponsor and presenter at the upcoming conference. On October 7 at 10:30 am, featured speaker Michiel Verkaik, Rivet Logic Senior Engineer, will present “Integrating Solr with Alfresco WCM for Faceted Search and Navigation of Next-Generation Websites.” Michiel will discuss the technical approach Rivet Logic uses for cost-effective Solr/Alfresco integration, content publishing with complete editorial control, real-time Solr indexing, and dynamic generation of website visitor experiences. As the Web Content Management (WCM) market continues to move and build momentum, the experts at Alfresco Software continue to hone in on and develop their world-class WCM portfolio to meet the demands and critical needs of companies worldwide. Join Rivet Logic and Alfresco for a free Lunch and Learn event to get an early glimpse of what enhancements and features Alfresco has added to its WCM and Document Management solutions to make creating and managing your valuable website easier than ever. Join Rivet Logic and a panel of experts for an information-rich webinar to discuss how business value can be derived from well-managed and easily accessible information. The first-ever Alfresco Developer Conference on November 3-4 in New York will give both new and seasoned Alfresco users an opportunity to sharpen their skills via deep-dive sessions on CMIS, WCM, content services, and best practices for ECM application development. Rivet Logic will be presenting on the topics of Crafter Studio and Alfresco/Solr integration. Participants can also learn about Activiti, the open source project that implements the new BPMN 2.0 standard.